On Thursday 22nd October 2015 the Friends of Dog Kennel Hill Wood held their annual general meeting in the Mother Goose Nursery Wildlife Garden, followed by a general meeting. Twelve people attended and the evening began in the heated summerhouse. The Chair began by giving a summary of the activities of the Group during the year. She reported that there were 34 members, 8 of whom had joined for the first time that year. Activities done during the course of the year included: Autumn clearance in Nov, meadow scything, RSPB winter bird count, winter tidy up, woodland trust “small coppice” pack planted, Spring Walk, Spring work day (weeding hedge), Gaumont events at Camberwell Arts Festival, Peckham & Nunhead Free Film Festival and Dulwich Society, clearing of new glade and a bat walk. A meeting had also taken place between the Chair and Paul Highman of Southwark council to discuss the management plan. This had been promised for the end of July but there was still no sign of it. We are also still waiting for the council to plant a bank of perennial showy flowers behind the noticeboard – this was meant to have been done a year ago. The Chair has chased this but to no avail. The Treasurer gave us a recent statement from the bank account and it was noted that we had not done any fundraising this year and were relying still on the monies raised at the Gaumont event last year. The Secretary asked us to approve last year’s AGM notes which we all did. The committee was re-elected as per the previous year and all members of the committee are keeping the same roles. The Chair gave each committee member a jar of crab apple jelly made with crab apples from the park as a thank you for their continued support. Members then paid their subscriptions to the Treasurer and that concluded the AGM part of the evening. Next up was a short General Meeting. The Chair showed the members the council’s plans to extend the SINC site of DKH Open Space to include the trees that border the Sainsbury’s car park alongside the park, including the nursery building and then also the addition of the area of trees that borders with Dog Kennel Hill, behind the recycling Centre. We all thought this was a good idea to prevent any building on the main road. We also discussed the proposal for Green Dale to be a SINC site. Everyone was in agreement with this plan. The Chair presented her idea to form a new glade in the wood, mainly by ensuring that we do not plant any trees in that area and we dig out the cow parsley roots. It was then agreed that we could spend some money on native bulbs, including: native bluebells, ransomes and yellow archangel. A work day would be arranged in November to start the digging. We discussed the state of the paths in the park and the wood. Both are in need of repair and there was concern over the increased footfall due to the Green Dale access improvements. It was decided that the Chair should apply for CGS money to get the path in the wood improved. A discussion about the type of path was held with a compromise being made between keeping it “natural” looking as it currently is but with improved drainage. Future work days would be needed for: glade clearing, bulb planting, hedge weeding and protecting the surviving whips with canes and spirals. We also discussed the need for insurance for the group. it is very expensive (about £200 per eyar) and as we don’t do many work days and no events are public it was thought that there was no need for insurance. All members must undertake activities at their own risk. “Any Other Business” included one of the members offering to buy two apple trees for the open space. The Chair will contact the council to request permission but there is a perfect spot available where a cherry tree was vandalised and removed. The meetings were over and we gathered outside for some cheese, bread (baked by Stephen Govier), membrillo (made by the Chair with quinces from the park), baked potatoes (provided by Jane Dillon) and wine. 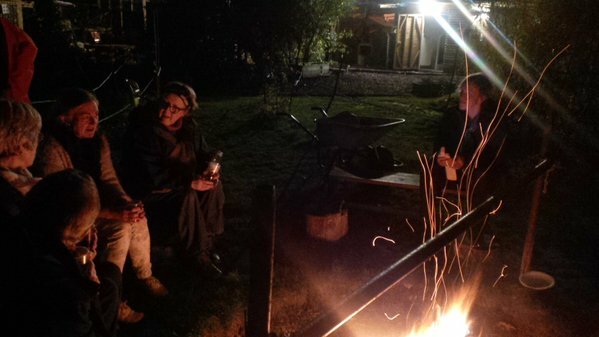 William had built a fantastic bonfire in the fire pit and we munched our way through the cheese and chatted by the fire. Many thanks to all of you who came along and to Mother Goose Nursery for allowing us into their wildlife garden. A nice change to being indoors!